What is the historic origin of these Indian burial grounds? I've recently watched two movies that feature the Indian burial ground as a plot point, however in these two films they both actually show a physical burial ground, which appears to be made up of concentric circles of rocks. I've never seen this anywhere other than in movies, and my Google searches mostly lead me to more images from these movies, so I'm curious where the inspiration for these came from. The two films (there may be others) that I saw these in are Pet Semetary (1989) and Bone Tomahawk (2015). Are these portrayals based on any actual burial ground ruins? 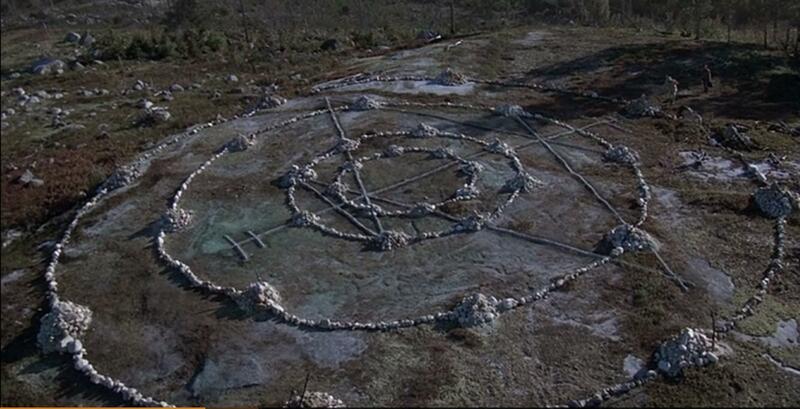 The stones are arranged in the shape of a wheel, 80 feet across and with 28 spokes emanating from a central cairn. The cairn, a ring-shaped pile of rocks, is large enough to sit in and is surrounded by six others that lie along the wheel’s circumference. Oddly enough, this configuration is not unique to Wyoming. Rather, hundreds of similar stone wheels exist throughout North America. Known as medicine wheels, or sacred hoops, these special structures have been built by American Indians for centuries. With uses ranging from the ritual to the astronomical, the medicine wheel has been appropriated over time by New Age spiritualists, Wiccans, and Pagans. Not the answer you're looking for? Browse other questions tagged historical-accuracy bone-tomahawk pet-sematary . How realistic was the communication between the troglodytes? What is Bone Tomahawk based on? What is the significance of the painting at Rachel's parent's house? Did these events in 7th episode 2nd season of Netflix 'El Chapo' actually happen? What is the painting J. Paul Getty buys in 'All the Money in the World'? In what time period the series Arang and the Magistrate set? Is Christopher Nolan's Dunkirk historically inaccurate in portraying absence of the Indian army? Why did the troglodytes come to Bright Hope?